The amazing super-exotic Porsche Carrera GT Fayence Yellow. This is one of the very first RallyWays car photography portfolio posts. A bold one at that! This photo was shot a few years ago before I was even shooting with a circular polarizer. However, due to the rarity of the car, the rarity of the color and the location, it has always been one of my favorites. 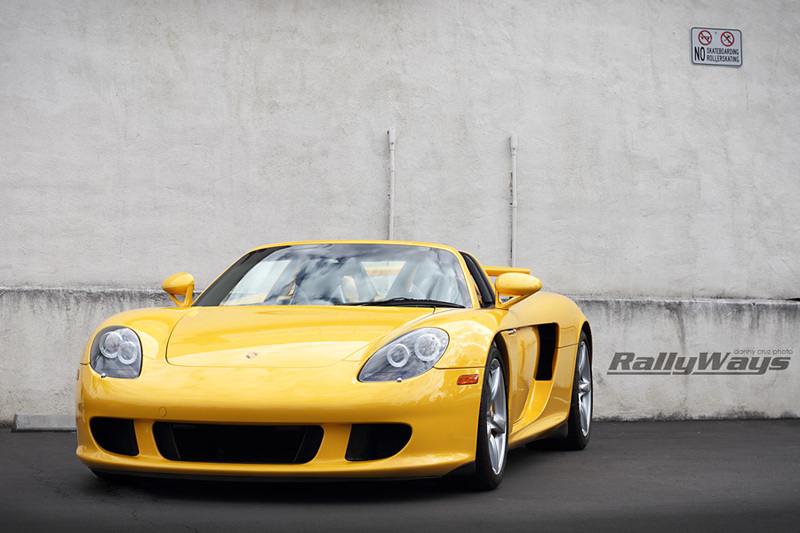 This 2005 Fayence Yellow Porsche Carrera GT is owned by a well-known car collector in San Diego. Only 1270 CGT’s were ever made. Of those, only 604 of them made it to the USA – which is in fact quite a lot. Since the US often doesn’t get some of the special cars Europe gets, getting half of the world’s production of the Porsche Carrera GT in the States is quite cool. This one’s rather special as most of the other Carrera GTs I’ve photographed are either silver or black. This is the only yellow one I’ve even seen, let alone photographed. The Porsche Carrera GT is such a special car that no matter the color, it stands out. Truthfully, it looks the part in such a bold color. If you are going to go super-exotic, might as well go with a loud color.